Club Penguin Cheats by Mimo777 Club Penguin Cheats by Mimo777: Club Penguin Environmental Reviewed By You! They are making a pudding plant?! Sign me up!!! I know Hnw (that's her nickname), and I don't know why she's gone. Maybe her computer broke down and she is saving up for a new one? Idk! I met her on cp and she said she's not allowed on mimos site any more. Please don't think I'm lying! I promise I'm not! Haha very funny idea but try to think of more ways you can help the enviroment probably by putting your litter in the bin! 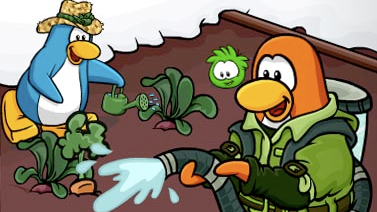 Wat if they grow coins and if you water in places you get coins just like the cave mine. Plant, Machine!? BIG DIFFERENCE! Lol! I'm X-cited about Mod Changes! I mean REALLY! Firestar9003 should be a mod. Anyway, keep modding and commenting everybody! I know! But the WEIRDEST thing happened! I was doing something for my reality show, and she came on CP!! Of course he is cool! Let me look cool up... *opens a dictionary to cool* It says... Cool: Mimo. Yes! Ba ba ba ba ba i'm lovin it! Sadly, that isn't how it works. You aren't just not on the list one day and on the top of the list the other. Don;t take this personally, but chances are, you might not make the list this month! I was a consistant mod, and it took me 6 MONTHS to become a mod, and I am the lowest mod on the list! If you make it on, you probably aren't going to be a Mimo mod.. maybe a Super Mod.. if you are lucky.. Cool.. I can stop playing Cart Surfer to get coins to buy an overpriced couch! Bwahahahaha!!! hey! ppl coppied my pudding idea word for word does that you mean you like the idea? if yes plz tell me! i wanna grow a reeses cup plant and maybe a funyuns plant funyuns are onion ring chips..reeses cups are chocolate candies with peanut butter inside or maybe ill grow a peanut butter plant or a chocolate plant which one should i grow?? I think they should plant mango, apple and chocolate trees! How about a video game tree? It's like there's a tree and that tree grows every video game(like Herbert's Revenge). It will only cost a cent! lol. Mimo, going out of Town today.I might not be able to mod for the rest of the week! ~Odawg~ (CPG MOD) p.s my club penguin account name is dewbug. Maybe she might be on holiday or if she lives in the United Kingdom she may be stuck where she is because of the volcanic ash from iceland. Hey why don't you dig for coins in the ine caves i got 250 once from there.It came in a coin bag.